Evangelistic-lutheran parish was founded in Olonets gubernia in 1858 and Olonets was the first place of pastor's residence. However, in 1865 parish's core translocated to the gubernian town Petrozavodsk where in 1871 a lutheran church was built. Detached lutheran community in Olonets was established only in 1904, but it had no its own church. After the 1917 revolution believers were being persecuted and the lutheran community in Olonets decayed. Olonets parish of Ingria Evangelistic-lutheran Church was officially registered in December, 1993, after USSR dissolution. Architectural engineer from Savonlinna (Finland) Yrjö Kauppinen developed a project of the stone church. Church building in the center of Olonets (Svirskih divizy str.) began in 1996 and costed 3,5 million finnish markkas collected as freewill offerings. Architect from Lahti (Finland) Paula Nurmi designed the inner garniture of the church. 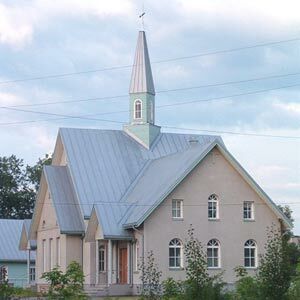 June 13, 1999, the church was blessed by Ingria Evangelistic-lutheran Church bishop Aarre Kuukauppi and Mikkeli (Finland) diocese bishop Voitto Huotari. In Vidlitsa was formed the Chapel parish.